The memorial service for the Rt. Rev. Alfred “Chip” Marble, Bishop of Mississippi (resigned) and former Assisting Bishop of North Carolina, will be held May 4th at 2 PM. Bishop Marble died March 29th; his funeral is taking place April 24-25 in Mississippi. The service is open to all who wish to attend; clergy are asked to vest. In addition, any and all who wish to take part in a “mass choir” are welcomed to bring their own vestments and join in. Please plan to be at the church by 1:15 PM to ensure time to park, vest, and get in line. If you have questions about the massed choir or other parts of the service, please contact the Rev. Warren Pitman either via email or at (336) 210-0602. 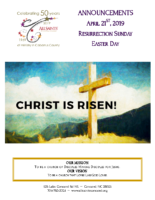 If you are a church group or individual who would like to help with the reception to follow the service, please contact Ayliffe Mumford via email or at (336) 273-5770 for detail on how you can help.